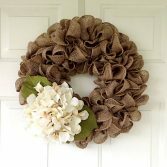 Door wreaths are the perfect welcome to the spring season! Spring is all about blooming flowers and vibrating colors. 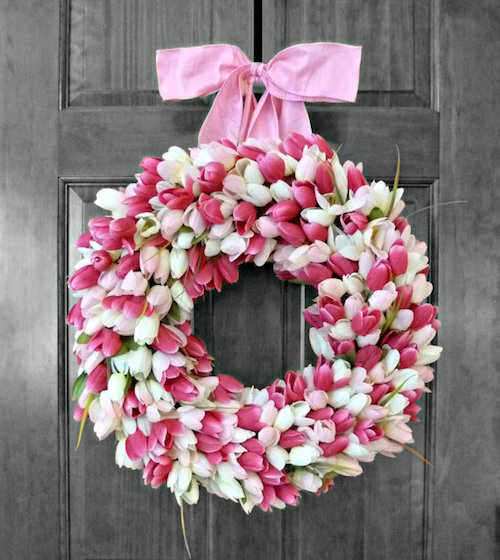 A wonderful way to bring all these to your home is to make lively pretty tulip door wreaths. They might look complicated, but they are really easy to make and you will need only a small number of supplies. The best thing about these tulip door wreaths is that you can choose your favorite spring colors for your tulips and make the ideal wreath to complement your house. Read on to find out how to make them! You can find the link to the door wreath video here. Start by wrapping the ribbon around the wreath form, covering every spot of the form. To secure the ribbon you can use floral pins at the beginning and the end of your ribbon or use a small amount of hot glue. Remove any tags from your tulips. Using your wire cutter, separate the tulips from their common plastic stem base so you will end up with smaller bunches/stems of tulips. Place a small bundle of tulip 3- 4 tulip stems sidewise on your wreath, so both the flowers and the stem are touching the wreath. Use a flower pin to secure it. Continue in the same direction, adding bundles next to each other until you have covered the entire wreath. You don’t need to cover the back of the wreath. If you find any gaps or unfilled areas, tuck in a few stems of tulips. You can secure them if necessary with floral pins. 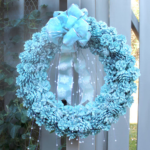 To make a hook for hanging you can use a pipe cleaner or a piece of ribbon that you tie into a loop and secure to the back of the wreath using a floral pin. 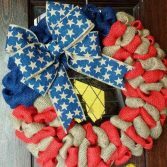 Having a seasonal door wreath hanging on your entrance door will welcome your guests and make your home standing out to any by passer. 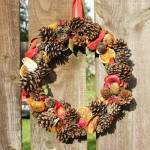 You can make wreaths suitable for every single occasion and every celebration. Just let your imagination guide you. 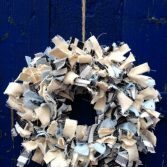 Making a wreath doesn’t have to be difficult. Just choose the right supplies and directions and trust your designer instincts and it’s sure that the result will amaze you. 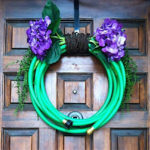 Having a spring wreath on your door is the perfect way to welcome this beautiful season. The colors you can choose are endless, since nature is just bursting with them. Inspiration can be found by taking a simple walk outdoors passing by gardens and parks full of spring flowers. Brighten your front door with tulips! So don’t lose any time. 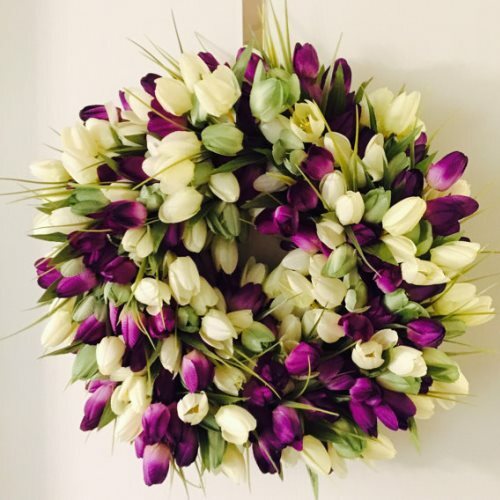 Next time you come across some wonderful silk or other artificial tulips grab a lot of them and make a beautiful wreath everyone will talk about. Choose your colors according to your home and taste and let the end result speak for itself. Also, using smaller or bigger tulip flowers can take you to a completely different outcome. To give your tulip door wrath even more character, add a beautiful monogram or other statement item to it. Finally, you can add some artificial grass here and there to give your wreath more volume. 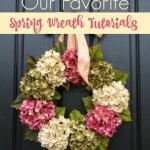 For more spring wreath ideas try this Hydrangea Wreath tutorial! Gorgeous! so easy to make! 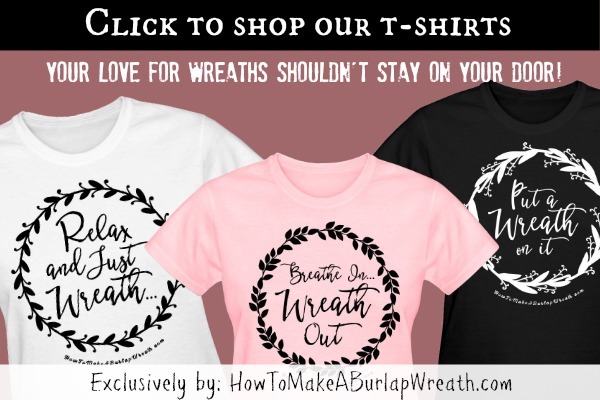 Your wreaths are very pretty! How creative! Thank you for sharing them with us. Absolutely gorgeous! I haven’t put up a spring wreath yet, because I have been debating what to do. I’m loving this idea! Pinning! So pretty, as usual. What a great way to welcome Spring to your front door! Visiting from The DIY Collective. Hey, Stella! Just wanted to let you know that we loved your How To Make A Pretty Tulip Door Wreath so much when you shared it at the #HomeMattersParty last week, we’ve FEATURED it THIS WEEK! Hope you can check it out when you get a sec. Happy Friday!!! This is absolutely gorgeous but I can only imagine how expensive it would be to get the artificial flowers to make it that full. Where do you get yours? All of our craft stores are so overpriced for artificial blooms! Love all your wreath ideas. The tulip is so perfect for spring!